The following is the full text of the letter from Bishop Senyonjo to Archbishop Rowan Williams and the Anglican Communion. Dear Archbishop Rowan Williams, Primates and fellow bishops, clergy and people of our diverse Anglican Communion. Peace from God: the Father, the Son and the Holy Spirit. I give thanks on behalf of the family and friends of David Kato for your love and prayers at this difficult time. All over the world, human beings are longing for liberation, love, respect and the dignity to have meaningful lives. This week alone, we witnessed it in Egypt .We also see this longing in the struggle for human rights for Lesbian, Gay, Bisexual and Transgender people (LGBT) through the sacrificial life and death of David Kato. As human beings, we must respect our differences and be united in our call for listening and sharing with each other. To understand God, we are all called to understand the mystery of each other, including our sexualities. God has given us this gift and to defame, condemn, imprison and kill human beings because of their God-given nature, is a great human error. The church has a tragic history of condemning Jews, Moslems, scientists and LGBT people. Our teaching and theology has a causal effect and if we do not learn from our own historical mistakes, we will repeat the same sinful destruction of lives, families and communities. When European churches failed to protect minority communities during World War II, people were sent to the gas chambers and concentration camps. Many religious people in Europe emerged from that experience to help create the Declaration of Human Rights. We now have sixty years of building an internationally recognised framework for the protection of human rights in every country. If Anglicans in one country dehumanize, persecute and imprison minorities, we must be true to the Gospel and challenge such assaults on basic human rights. They key to our ministry must be to educate our people and encourage LGBT people to tell their stories and the impact of homophobia in their lives. Listening to the stories of LGBT people was the beginning of my own transformation. This work of understanding the phenomenon of human sexuality should be taken seriously in our theological seminaries and schools. The clergy should be well equipped to serve and not to ignorantly repel the people of God. A required course in Human Sexuality should be required of all seminarians and clergy. Many African countries imprison LGBT people because of who they are. As a bishop in the midst of those countries, I am now a shepherd caring for the lost sheep that are persecuted by the Church and threatened by a pending anti-homosexual draconian bill in Uganda. I preach the new covenant of Jesus Christ sealed in love as we read in John 15:12. This is the heart of the Gospel-the Good News. This sacrifice of Love is mocked when sister churches tolerate or promote the violation of basic human rights. Life and liberty are at risk and we must hold each other accountable. A loving Anglican Communion should not keep quiet when the Rolling Stone tabloid in Uganda openly supports the “hanging of the homos,” including a fellow bishop who pleads for their inclusion and non-discrimination! Silence has the power to kill. We have witnessed its destruction this past week in the tragic and cruel murder of David Kato. We African Anglicans have a rich and powerful history of speaking out on human rights in the most difficult of situations. Bishop Colenso worked with Zulus to establish an indigenous church while being fought by his fellow English bishops. Bishops Trevor Huddleston, John Taylor and Desmond Tutu resisted Apartheid. We must not demean our great tradition by oppressing LGBT minorities under any circumstances, even to maintain Anglican unanimity. The criminalization of homosexuality remains the greatest state and church sanctioned violence perpetrated against LGBT people and their allies in many countries. We must agree to demolish all forms of institutional homophobia beginning with the removal of all laws that punish human beings for being gay or living in loving relationships. This will be the first step in providing basic human rights to a largely invisible international community who live in daily fear of their lives. So in thanksgiving for the unity and commitment we have together, let us continue to listen to one another, to protect the vulnerable and marginalized within our own societies and to bring our collective wisdom to the work of repairing the world and correcting the great injustices in our local communities. Bishop Christopher presided over the graveside service for David Kato, after the Anglican Lay Reader assigned to preside over Kato's funeral launched into an angry rant against LGTB persons. H/T to Leonardo at Eruptions at the Foot of the Volcano. Here's the link to make a donation to St Paul's Foundation. Thanks to SCG at Wake Up and Live for the link. SCG's birthday is on Valentine's Day. She suggests you send her a valentine by making a donation to St Paul's Foundation. Male Bishops are much more Episcopal sounding when they're actually men. Rowan "Who" could learn a lot from this man. Reminds me of the Paul Monette autobiography. Say what you mean, and mean what you say. I hereby charge Bp. Senyonjo with plain speaking. And what a relief! WOW! Just WOW! Brings tears to my eyes. Thanks for printing it here, Mimi. Something for Rowan to pay no attention to, beyond yet another pro-forma bouquet of clichés, as he prepares for his fence-mending (he hopes), globe-trotting GAFCON charm-initiative tour. However Rowan receives it, Bp. Christopher's excellent letter deserves wide circulation. See also the Rachel Maddow show segment about Bishop Christopher Senyonjo. I understand that the St. Paul's Foundation for International Reconciliation, led by the Rev. Canon Albert Ogle, is coordinating international financial support for Bishop Christopher. If anyone has contact information for them, please post. Paul (A. ), how are you? It's great to hear from you. Leonardo posted an email address for Canon Ogle which I will add to the post in an update. I'll check out Rachel's segment. Plan to make St. Paul's Foundation among my "Valentines" as has become my birthday tradition to encourage my friends to donate what they would spend on a gift for my V-Day birthday, and give it others to spread the love. 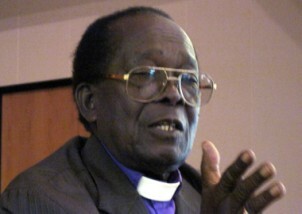 Perhaps Orombi and Akinola were right: Africa will be the reawakener of Christianity - not, though, because of people like Orombi and Akinola, but because the suffering they inflict raise men like Tutu and Senyonjo. I'm stealing this and crediting Leo. SCG, what a wonderful idea. Mark, and to think that Bishop Christopher is excommunicated from the Anglican Church of Uganda for his support of LGTB persons. Counterlight, good. The more the excellent letter circulates, the better. Göran, another living saint, indeed.